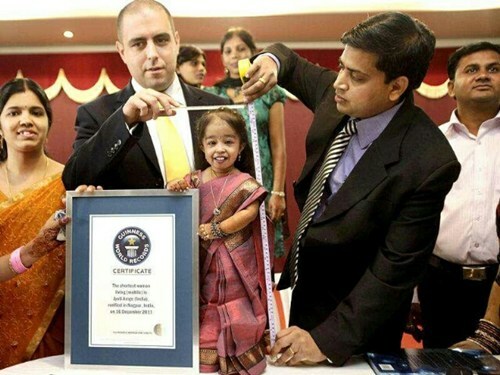 According to Guinness World Book of Records, Jyoti Amge is the smallest living woman on planet earth. The woman from India who is 23 years-old has held the title since 2012. She got married to the love of her life at the age of 23. She was born December on the 16th of 1993. Jyoti, has a height of 62.8 centimetres (2 ft 0.6 in) and from medical records, her restricted height is due to a growth abnormality called achondroplasia – which means she will never grow any taller than 2 ft 1 in (0.64 m). As the smallest woman in the world, it’s neither all negative for Jyoti Amge nor has it done anything to hamper her progress — her status has also taken her to greater heights actually. She ended up living her dream of becoming a Hollywood actress when she was cast in the fourth season of American Horror Story: Freak Show as Ma Petite. Getting people’s attention is something Jyoti Amge has gotten used to all her life – though it made her uncomfortable at first, she said she finally learn to live and enjoy it.